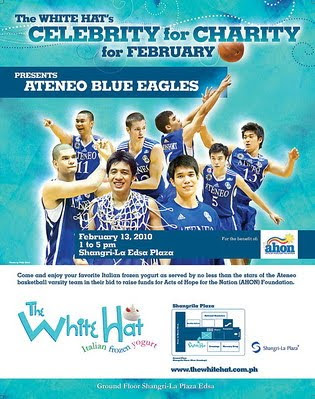 On Saturday, February 13, 2010, the ATENEO BLUE EAGLES will team-up with AHON (Acts of Hope for the Nation) FOUNDATION and THE WHITE HAT (TWH) – Italian Frozen Yogurt to show their love towards Filipino public school students. Together, they will raise as much money as they can by selling & serving authentic Italian frozen yogurt at The White Hat’s SHANGRILA MALL store. TWH has pledged to donate HALF of the entire day’s sales to AHON FOUNDATION who, in turn will use the money to build more libraries for public schools to raise literacy rates among the poor. According to AHON FOUNDATION, more than 90% of our students currently study in public schools, but only 10% of the 37,000 public schools have adequate libraries. This is then the mission of AHON, to inspire future leaders of our country by making sure they are literate. AHON has already helped build 30 libraries, the latest one in Pateros (Sto. Rosario Elementary School) which luckily escaped the wrath of ONDOY. 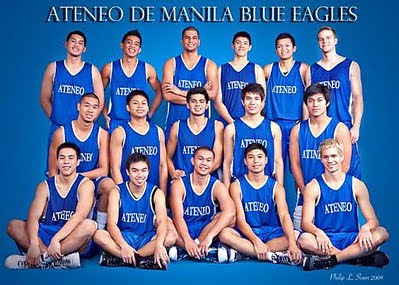 On the other hand, the ATENEO BLUE EAGLES have generously agreed to volunteer themselves as guest celebrities in The White Hat’s CELEBRITY-FOR-CHARITY event whereby customers get served the best-tasting frozen yogurt by celebrities. To make the event even more fun, customers who buy yogurt on this day can have souvenir photos taken and even ask the BLUE EAGLES to autograph memorabilia on the spot. Indeed it’s a fantastic team-up of three prestigious groups demonstrating to the world that LOVE is all about sharing blessings to the less fortunate. So mark your calendars and help support this worthy cause by dropping by SHANGRILA MALL on Feb 13 from 1 to 5 pm. Grab some yogurt, high-five with the BLUE EAGLES, and share YOUR love too.